It turns out that omnivorous locavores may be bending over backwards for no reason if their goals are environmental. Read the Forbes article that takes the meat out of the locavore argument and puts the emphasis right back on the largest single contributor to greenhouse gas emissions: meat and dairy. But we know that already, right? There's nothing green about local bacon aside from the greenwashing in which it's packaged. It's almost as bad as the "humane slaughter" myth. PETA recently took some heat for asking us to save some whales - from blubber. Women went nuts when PETA put up a billboard saying that adopting a vegetarian diet can lead to weight loss, and now they are going after the guys! So what do you think? Offensive or crafty? Meatloaf is not just for meat-eaters. 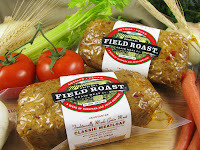 With 33g of protein per serving, Field Roast's Classic Meat Loaf packs some serious muscle. Order it online or check your local retailer. Walk like a man. We often hear about all the things we should do "like men". But now, you can really walk like a man, by raising money to benefit Farm Sanctuary! Click HERE to see all the walk dates and locations. To raise funds in person, please use the Offline Donation Form. You’ll need to bring the completed form and any donations with you the day of the Walk. If you can't make it and want to sponsor someone, like our friend Gretchen or Dave, or simply donate, please do that too!